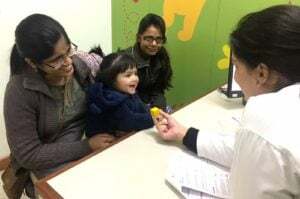 This “preventive pediatric care plan” promotes an age dependent set of guided assessments and interventions ranging from simple laboratory tests to parent answered questionnaires. It works to identify dormant medical conditions that may unfold later if left unattended. It also allows early identification of risk factors in a child’s environment that warrant timely attention and thereby leave no stone unturned in nurturing a developing child’s complete potential. The whole plan revolves around synchronized preventive screening, counselling and vaccination care delivered by the Pediatrician and Child Health Educator and coordinated by the Service Coordinator. To ensure that the benefit of this care plan reaches the maximum number of families in the best possible way we introduced the concept of “Child Health Educators”. A Child Health Educator is a friend, companion and guide facilitating, de-medicalizing and completing the care provided to the infant. Infant Care Guidance at 3, 6, 9,12th,15th month and so on..
To schedule an appointment click the button below or call on +91 8800143584 or 011 4211 1111 for queries.